The sheer wealth of social media monitoring tools available is matched only by the richness of practical uses that they afford users. Considering this, I thought it would be useful to list some of the key ways you can get the most out of your monitoring tool, starting with identifying influencers. This is something I mentioned in the last post, but clarifying exactly why you want to find influencers will inform who you are looking for. Are you seeking notorious individuals with only a passing association with your market, or are you looking for bona fide industry experts? It’s best to establish these aims as soon as you can, preferably before you being any monitoring in earnest. Your objective may be to isolate the biggest advocates of your brand to complement some of your marketing or sales activity, or perhaps to help your community management efforts. This means you’ll be looking for those that already talk about your industry or brand in particular. Looking at a data set about Raspberry Pi, we can investigate the best ways to find these types of authors. Remember that though in this example we’re looking at specifically influencers about Raspberry Pi, it could also be about a wider trend or industry, not just a brand. A smart first move would be to view your authors (or just twitter handles in the less-potent tools) and sort them in order of volume of mentions that match your search over a set time period, in this example two months. It’ll come as no surprise that the official Raspberry Pi account is the author that most frequently mentions their own product. Authors such as Rob_Bishop also reveal themselves to be employees upon closer inspection of their profiles and mentions, though others begin to look promising. This is definitely an essential: evaluating the content of these blogs and tweets is the only way you can truly assess how appropriate each influencer is. Indeed, RaspHub prides itself on providing news about the Raspberry Pi product, so could be a potential influencer. Looking more at individuals rather than institutions, authors such as Matt Richardson – who has mentioned Raspberry Pi over 70 times over the past two months – definitely an indicator of an advocate. You may also be wishing to target blogs and sites, rather than people. We can then filter by site type – news, forums, blogs etc – to find the sites that are mentioning Raspberry Pi the most. Using this process, we can see that Element14, Adafruit and Linuxlife are all frequent discussion places of the revolutionary computer, if we filter to view only blogs. Verifying these advocates as credible, or at least worthy of your efforts, is also important. After compiling your list of potential influencers (either people or sites), it’s time to validate them. Evaluating the metadata attached to each mention is integral for this stage. With sites you can look at various third-party scores, such as Comscore or Alexa traffic stats, backlinks or even better – MozRank, if your tool provides it. They are all useful ways to make sure the sites are credible and have an audience that is worth pursuing. Many tools will also include demographic data for the visitors of each site, which may help you further understand whether that site’s influence is relevant to your aims. With individuals, it’s a different type of metadata that you’ll be looking at. Initially, you can assess the raw metrics, such as number of followers, network size and other numbers that indicate reach. Stepping into murkier waters, there are countless influence-quantifying systems available that attempt to give a value to each author. At Brandwatch, we use Kred’s Outreach and Influence metrics as well as PeerIndex scores to help users determine which influencers are more significant than others – the tool also includes a bespoke system to measure influence across all mention types. Other tools will have either custom metrics, alternative partners (likeKlout) or may leave it up to the user to decide which metrics are the most important in determining influence for them. In any case, it’s this metadata that will help you validate the quality of each advocate, helping you create your perfect list of influencers. Your company’s aims may be more focused on finding higher value influencers that are as-yet not converts of your brand, industry or niche. This process is easy enough for you to engineer, it’s almost a case of reading this article backwards. You can use the same data set, but initially instead of ranking by frequency of mentions, you can use the accompanying metadata to filter your results. Returning to the Raspberry Pi example, this would involve selecting the influence metrics you find most useful (for this example I’ll use the Twitter-only Kred Influence) and sorting accordingly. This stage requires a bit of manual input. Though sorting by influence will bring the most important influencers to the top, they may be too difficult or broad to consider a viable target. In this case, it’s not unreasonable for Raspberry Pi to consider TechCrunch Twitter account as a realistic influencer to target with their content, but a smaller company may eliminate these as too influential. Scobleizer however, appears to be a valuable influencer, with almost 300k followers and high Kred influence scores. 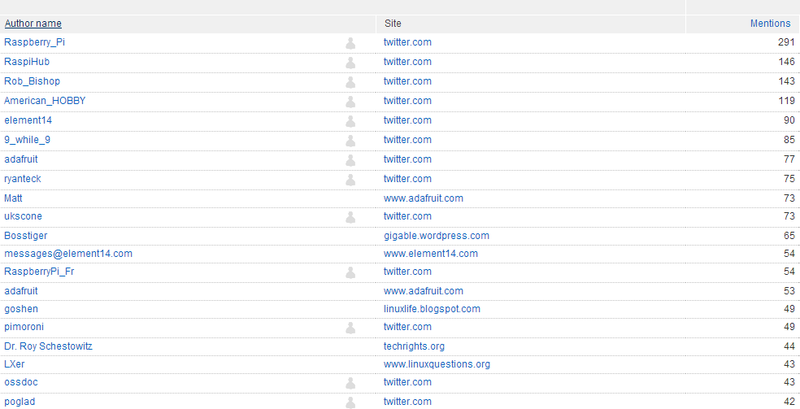 Looking at MozRank to determine influence also highlights a few notable blogs, like makezine.com and wired.com. It’s best to use a combination of different influence and credibility metrics to isolate the mentions you’re most interested in, so that you produce a list of high value targets from a range of criteria. Now comes the second stage of the reversed process, whereby you make sure all these high influence value mentions are relevant enough to your search. Look through your influence group you have just complied – some tools will allow you to create author or site groups in the app – and check to see how many times your search is matched. One mention on the BBC is sure to have high influence metrics, but this is where you realise they have too broad an audience and have only mentioned your product once in the past year. Diving into the specific mentions will also help you paint a clear picture of how relevant each influencer is to your search, and by looking through their posts and tweets you can get an idea of the context of each mention. This validation process will help you find that happy balance between frequency of mentions and influential authors, in the opposite way we produced the list in part one of this post. You need to be looking at both relevancy to your search AND the metrics that help determine influence. Your approach may value one process over the other, but the essential part is that you undergo both of them in order to find a suitable list of influencers. This is just one of a series on the most effective ways to use a monitoring tool, so stick around for more insight.